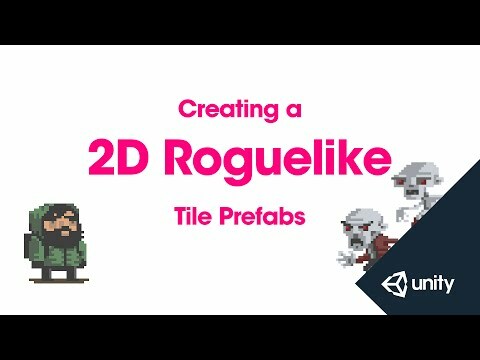 This is part 3 of 14 of the 2D Roguelike tutorial in which we create the tile prefabs for the floor, wall, food, soda and exit prefabs. floor, food pickups, obstacles and exit. which is going to serve as the background for our level. Let's go ahead and create a new game object. And we're going to add a sprite renderer component. to the next sprite in our sheet. And then we're just going to repeat the process. I'm going to fast forward the video while I do this. Next we're going to create the Exit tile. We can reuse this, change the name to Exit. And select our ExitSign sprite. so that we can detect when the player has moved on to it. but just detect the collision. so that it will be rendered under the Player but in front of the Floor. to our Exit tag that we defined earlier. Drag that down to our Prefabs folder. Next we're going to create our Food object. to our items layer and we're going to change the tag to Food. We're going to make our Soda object next. to our predefined Soda tag. they're just going to be picked up if the player moves over them. Drag that down to the Prefabs folder. Inner and Outer wall tiles. Let's do the outer walls first. And we'll select our Rocky wall sprite here. from moving in to it's space. We're going to set the tag to Untagged. because this is actually going to block the player's movement. which nothing is going to be able to move in to. Drag it to the Prefabs folder. And we can reuse this for OuterWall2. Rename it to OuterWall2 and let's change the sprite. Now to be clear, these are only visual variations. which is why we're creating these. And we'll do OuterWall3 as well. from moving around the level. and we're going to change the sprite as well. We'll use our first bramble sprite. the sorting layer to Items. going to keep it on blocking layer. And now we're just going to create a few variations. Change the sprite, drag it down. our our game board using a script.